Looking to throw a classy, elegant outdoor event but unsure of what shelter to use? Look no further than Empire Tents to keep you covered! Throwing an outdoor event can prove to be tricky do to the many variables that have to be considered. Certain variables are out of your control, such as the weather. The weather can change at any moment and could be the breaking point to what would have been a marvellous occasion outdoors. This is why using some form of a shelter is a necessary requirement for any outdoor event. Empire Tents recommends the use of a stretch tent in many types of outdoor occasions, this style of tent is very different to traditional cover options such as marquees. Aside from looking absolutely elegant, here are a few more reasons as to why you should utilise a stretch tent for your next outdoor event! Stretch tents offer great flexibility, a single stretch tent can be positioned in a variety of different configurations make it an ideal fit for just about anywhere. Traditional pole marquee tents generally consist of a roof canopy, supported by tall centre poles and tensioned on the side lines that are secured by stakes that are driven into the ground. When using a stretch tent, these constraints found in the traditional marquee tents are not found. A stretch tent is essentially a “free form” fabric structure that has been erected through tension. The stretch tent itself is a single square piece or rectangular piece of specialised fabric. The fabric is set up and then manipulated into the desired position through the use of various lengths of pushing poles. These poles are pushed into the fabric and then secured in place to give of the desired pattern. Once the tent has been deconstructed, the square or rectangular piece of specialised fabric returns to its original state (size). This basically means that a single tent can be rigged into multiple configurations depending on the venue, this effectively means that a stretch tent is the most versatile tent option available! Stretch tents can be erected off and around existing structures within a venue. Unlike traditional marquee tents which are independent structures, a stretch tent can literally be attached to any existing venue and used an extension. These stretch tents are also able to be erected as a fully concealed venue to protect against harmful weather conditions, or erected with either one or two sides up, allowing open access and viewing to the venue. 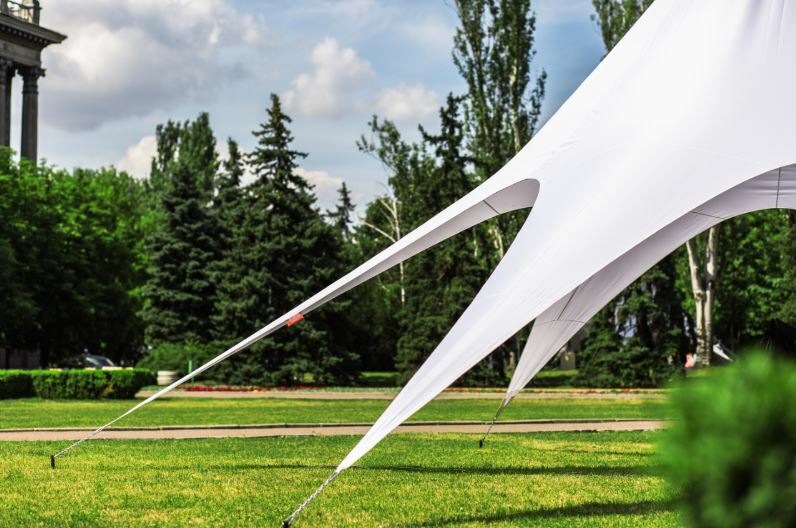 Stretch tents offer comfort, these tents are made from a specialised waterproof stretch tent fabric that is also highly breathable and sound absorbing when compared to the traditional PVC materials used to construct marquee covers. The more breathable material means a less stuffy and less noisy venue, especially in summer months. Another great feature of these tents is that they generally pack down to a relatively small size and a pile of articulated poles. The poles generally also breakdown to 2m and 1.5m lengths. When comparing the storage and transportation of a stretch tent to a traditional marquee, the stretch tent is a winner yet again. Stretch tents can easily be transported on the back of a small utility van or small truck. A traditional marquee requires an entire team to assemble it, a stretch tent however requires very little man power to assemble. An experienced individual will be able to comfortably rig a 50 square metre tent on his own if really necessary. Larger stretch tents require no more than a team of 5 to assemble. Another winning feature of a stretch tent is the setup time involved when erecting one of them. The actual setup time at large events are usually around 6- 7 hours whilst dismantling is completed in a mere 2 hours! Stretch tents also come in a vast range of colours and like sizes are able to be linked together they are also available in many sizes as compared to traditional marquees which are generally manufactured in set sizes. Having a private party at home used to exclusive to those with larger properties, however with stretch tents, the party has been spread to anyone and anywhere, from a small garden to a simple courtyard, any area can be transformed into a party venue. The atmosphere beneath a stretch tent is electric! Perhaps the biggest deciding factor between a traditional tent and a stretch tents would be the vibe and atmosphere experienced beneath them. Gone are boring white interiors draped in fabric and flowers. Stretch Tents hold a different kind of romance. The atmosphere beneath these tents is spectacular. The gentle curves of the fabric create an impressive interior that requires little or no dressing. During the day, the light is soft and inviting. At night, the addition of lights or graphic light shows bounced off the fabric brings everything to life. So when you are out hunting stretch tents for sale, look no further than Empire Tents, industry leaders with the best stretch tent pricing.